Make Spring cleaning a time to consider the overall safety of your home. If you plan on tackling spring cleaning projects, as Personal Injury Lawyers, we always suggest that you take a few steps around your house to ensure a safe environment for you, your family and your visitors. Here’s a list of our top five tips to consider when doing your annual clean up. 1. Fire extinguishers - Extinguishers should be installed in plain view above the reach of children near an escape route and away from stoves and heating appliances. They require routine care and should be inspected and serviced annually. Rechargeable models must be serviced after every use, and disposable fire extinguishers can be used only once and replaced. 2. Smoke & Carbon Monoxide Detectors - Smoke detectors should be tested monthly and there should be a working detector on each floor of the home and in each bedroom. As part of your spring clean up, make sure that you change the batteries in your smoke & carbon monoxide detectors. 3. Your Medicine Cabinet - We all have that medicine cabinet with a slew of medications we haven’t touched in months and are long expired. Spring cleaning is the perfect time to sort through all of your household’s old medications and properly dispose of expired and old medications. 4. Chemicals, Cleaners and weed killers - Your home is most likely full of potentially harmful household chemicals that include everyday products like bleach, oven cleaners, drain de-cloggers, insect and weed killers. Treat those household chemicals like the toxic materials that they are and dispose of them like hazardous waste. 5. Stains, varnish, and paint - Dispose of all oil-based paints that you never us at your local Hazardous Waste facility. Some Vermont communities offer year-round access to these waste-handling services, while others offer specific drop-off days. Unlike oil paints, latex paints aren't considered hazardous waste. If you have leftover latex paints that can't be recycled, reused or stored, pour the paints into a box with shredded paper or kitty litter, allow it to solidify away from kids or pets, then discard in the trash. 6. Clutter - In the middle of a spring cleaning whirlwind, you may even add to the clutter that you are trying to rid your house of simply because there are so many tools and supplies being used. Keep clutter off the floor as much as possible to avoid tripping and falling, and clean up after yourself every night, even if you’re going to be working on it again the next day. Some Halloween Safety Tips from Vermont Accident Attorneys - who are also fathers. With October just around the corner and families starting to prepare for Halloween, the Personal Injury lawyers at Brady/Donahue want to ensure that your family has a fun and safe Halloween this year with some of the following tips. Pumpkin carving can be a fun activity, but it can also be dangerous. Make sure to keep a close eye on children and knives to avoid any personal injuries or accidents. Whether you’re placing candles around your house or in a pumpkin, an open flame can be dangerous. You can avoid the risk of an open flame by swapping out real candles for battery-operated ones. With Vermont foliage often at its peak around Halloween, make sure to keep both the walkway up to your house and your yard clear and well-lit for trick-or-treaters. With allergies and the risk of illegal tampering, homemade treats can be suspect. When preparing for trick-or-treaters make sure to only hand out store-bought treats. Make sure that costumes are flame resistant and properly fit your children. If wearing a mask, ensure your child’s vision is not obstructed. Props, such as swords or wands, can result in accidents. Check that your child’s props are not too long or too sharp to prevent accidents and personal injuries. Make sure to have a specific route in place and a curfew for when they should return home. Know who your children are in a group with and keep parental contact information for if needed. Ensure your child has a cell phone with them to reach you in case of an emergency. Check your children’s Halloween candy for any choking hazards, spoiled items, or illegal tampering. Keep an eye out for children, especially when driving. Vermont roads can change quickly from rural to residential areas so watch carefully when entering a town or village. Drive slower and stay alert. Trick-or-treaters will usually be out when it is getting dark, so make sure to keep your headlights turned on to increase visibility of all pedestrians. As children are full of excitement, they may be unpredictable. Avoid all distracted driving to reduce the risk of a car accident. If you or a loved one faces a personal injury or car accident this Halloween, the Vermont Personal Injury lawyers at Brady/Donahue are here to help. To schedule a free initial consultation, please call us today at 802-855-2001 or fill out our quick contact form. The Personal Injury lawyers and staff from Brady/Donahue catch the game at Fenway! 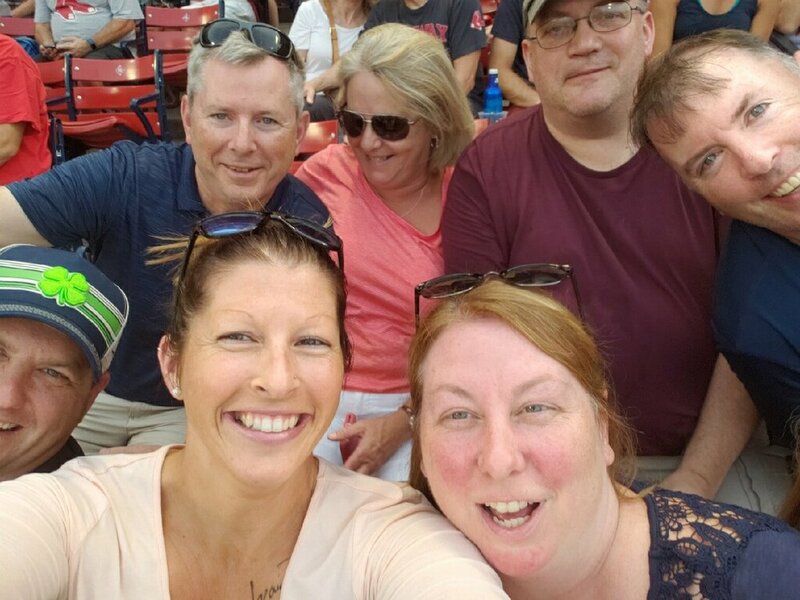 As part of an annual tradition, Brady Donahue lawyers and staff got together at Fenway Park on Friday night to watch the Boston Red Sox win on a 10th inning walk-off home run from Mookie Betts. As an employee it is important to know how to properly handle workplace injuries. The specifics of workers’ compensation laws vary from state to state, but the general responsibilities of employers and employees remain consistent. For employers, it is their continuous duty to ensure the workplace is safe for all employees; as an employee, it is your job to act in an appropriate manner while at work. If you have been injured while working in an altered state or while engaging in an activity that is specifically prohibited, you will not be entitled to workers’ compensation benefits. Workers’ compensation covers injuries that happen in the line of duty, regardless of fault. For example, if you are injured while responsibly climbing a ladder while working, you can file a workers’ compensation claim. Typically, workers’ compensation will not cover injuries that happen during your work commute or off-site during non-working hours. Workers’ comp is available to all employees, unless an independent contractor, domestic worker, or certain categories of agriculture workers. Workplace injuries often result in more expenses than just medical. Depending on the severity of the workplace injury employees involved in a workers’ compensation case are entitled to wage benefits, medical expenses, vocational job retraining, permanent partial disability benefits, and permanent total disability benefits. If you are faced with an injury at work, it is important to immediately report your injury to your employer or immediate supervisor. By law your employer is required to fill out this form. Make sure to review the form to ensure all information is accurately reported, and request a copy for your own records. The longer you wait to report your workplace injury, the more difficult it will be to obtain workers’ compensation benefits for the injury. If you are caught exaggerating your injury in the report you may face serious legal consequences. As an injured employee, you are not required to hire an attorney to assist you in the workers’ compensation process, however, it is highly advised, especially with claims that may result in greater benefits. What if my employer refuses to report my workplace injury? When an employer refuses to report a workplace injury it is almost always because the employer is trying to avoid the associated costs. All employers are required to have workers’ compensation insurance, however, the expense of paying out claims can be quite heavy. If your employer tries to convince you that you are not eligible to receive workers’ comp, refuses to file a claim with their workers’ compensation carrier, or lies about the filing of a claim, contact the workers’ compensation attorneys at Brady / Donahue. Even when your workplace is the football field, a good Workers’ Comp attorney could be your best ally. All workers are entitled to compensation for injuries sustained on the job — even professional athletes. At the Vermont-based, Workers’ Comp law firm Brady / Donahue, we not only handle a wide range of cases related to workplace injury, but as sports fans, we thought it would be interesting to relate some of the Workers’ Compensation issues facing former NFL players. Although all jobs pose a risk for injury, some careers such as professional football carry a lot more. Football is a violent, injury-riddled sport where torn knee ligaments and concussions are often considered just another day at the office. In a recently published article, Forbes Magazine highlights Chicago Bears running back Matt Forte, arguing that the injuries to his back, neck, wrist, ankle, shoulders and knees were costly hazards to his job as a professional football player. Forte is currently engaged in a Workers’ Compensation case against his former employer to receive payment for injuries and lost wages. He is trying to get money for those injuries through the Illinois Workers' Compensation Act, where workers injured on the job — even professional athletes — can file a claim. While most teams will settle these cases out of court with a lump sum payment, it is important to note that NFL players have a range of advantages when it comes to workplace injury, from provisions in their contracts that pay for medical costs to collective bargaining arrangements that provide compensation for injuries. But if you aren’t a professional football player, what kind of protection do you have if you are injured at work? At Brady / Donahue, we specialize in helping injury victims obtain the Workers’ Compensation that they deserve. Whether you are a middle linebacker or a hardworking Vermonter, the Vermont Workers’ Compensation process involves complex legal and procedural issues, complicated forms, and confusing rules. While employers and insurance companies may not be as generous as NFL teams when it comes to payouts, as one of Vermont’s leading firms for Workers’ Compensation, we can honestly say that in the unfortunate event of a workplace injury, after medical assistance, your first call to make should probably be to a qualified Workers’ Comp attorney. If you’ve been injured as a result of your job, don’t jeopardize your rights – call or text Brady Donahue today for a free consultation. Last year there were over 14,000 car crashes in the state of Vermont. Getting into a serious car accident can be a scary and stressful situation, and with emotions running high, it’s easy to forget what steps to take to protect yourself from further damages. Here's our quick checklist to follow if you unfortunately find yourself dealing with a traffic collision. You and your passengers’ safety is of the utmost priority when a car accident occurs. If possible, move your car to the side of the road where it won’t obstruct passing traffic. Be sure to stand away from your car - in fact, many motor vehicle crash injuries occur when a passing car strikes a parked car. Motor vehicle crashes are a leading cause of injury in the United States. From seat belt burns and concussions, to serious comas and death, car accidents are incredibly dangerous. Check yourself, the other driver, and any passengers for injuries. If any injuries or medical emergencies are involved, you should immediately call 911. It is important to have an official police report when filing a claim with your insurance company. Many people forget to involve the police after an accident, exposing themselves to risk if an auto accident claim or personal injury case goes to court. If you end up pursuing an insurance claim or defending yourself from false accusations, it’s always helpful to have a police document in hand. Usually the responding police officers will handle this part, but if they are not there, you should take down the names, addresses, and telephone numbers of all drivers and passengers involved. You should also copy their proof of insurance and obtain contact information from any relevant witnesses nearby. Photo evidence is crucial - not just for auto body damage but also personal injury claims - and it lends credibility to any testimonies during a case. Document all evidence of visible damage to property and people alike. Contact your insurance company to begin the claims process. Keep track of all the information related to your claim, including medical bills, rental car receipts, and any other expenses you might have due to the car accident. Reach out to an attorney at Brady Donahue for a free initial consultation, whether you are at-fault or a victim of the accident. Common issues that can arise from a car accident include fraudulent claims made against you, insurance companies neglecting payments for medical attention, and even employer liability for accidents at work. Before you ever to speak to the other party’s insurance company, you should seek legal advice - your entire case may hinge upon it. The attorneys at Brady Donahue have vast experience in navigating the tricky landscape of the personal injury field and auto insurance industry following a car accident. If you’ve been injured, contact Brady Donahue today for a free and confidential consultation about your case. These days, it seems like we post everything: what we ate for breakfast, our triumphs, funny moments, our workouts, our complaints, our frustrations – even anger. According to an article by FastCompany.com, posts displaying anger or outrage are shared more than posts expressing joy or sadness. And that’s where the trouble lies. Especially, if you’re in the middle of a personal injury case. One post could swing your case one way or the other. So, ask yourself, “Is the risk worth it?” We don’t think it is. 1) Nothing ever dies in social media. It doesn’t matter if you deleted the post or your account, nothing ever dies on the Internet. A good rule of thumb is to post things you wouldn’t mind a potential employer or business client to read. Translation: stop posting pics of that time you did a keg stand back in college. Posts like that can damage your credibility. Another tip: if you’re involved in an accident and need to speak with a personal injury attorney, like us, put yourself on a social media hiatus until your case has reached a final verdict or settlement. Also, talk to your friends, make sure they don’t post things about you without your consent. 2) Insurance companies use social media to find out about you and your injury. Insurance companies have a job to do – to make sure you’re not lying when you say you’re injured. To find proof, they’ll do everything from background checks and hiring a private investigator to reviewing all your posts on social media and any posts in which you’re tagged. By posting things about your case, you risk giving the insurance company fodder for denying your claim. 3) Attorney-client privileged communications aren’t always so private. We all text, email and many of us use apps like Facebook Messenger to quickly talk to our friends and business acquaintances. The thing to remember is that those conversations aren’t as private as you think. In fact, you may be inadvertently waiving your right to keep those conversations private just by using those types of communication platforms. When talking with your attorney, use the phone, correspond with letters or ask your attorney to send email messages through an encrypted site. 4) Social media can spoil the evidence in your case. When an incident happens, a knee-jerk reaction is to jump onto social media to vent. You may be tempted to share all the details online, but don’t. After all, you could be accidentally creating damaging evidence, which could hurt you at the time of settlement or trial. And trust us, that’s the last thing you want to do, especially when your case may involve hundreds of thousands of dollars in damages. Moral of this post: Share at your own risk. And when in doubt, ask your attorney. Meet Brendan Donahue of Brady /Donahue! Brendan originally grew up in Connecticut, but spent a lot of his time in Worcester, MA with his Italian mother’s side of the family. He played football in high school and at Bates College, where he graduated with a B.A. in philosophy. Brendan first came to Vermont for law school and ultimately landed at Brady/Donahue in November of 2000. Once settled in VT, Brendan met his wife Kathleen and they have two children. Their hobbies include being outdoors with their dog Daisy Mae and being active members of their karate dojo in Claremont, NH. WE TOO, KNOW HOW MUCH SWEAT IT TAKES TO WIN. As a local company, we want to make sure we support and get involved in our community. This winter we are sponsoring the Springfield High School Cosmos’ sports programs as a way to keep students active and engaged in the community. As a way to create a common thread between our firm and the sports program, we created an advertisement that speaks to a value we both share - sweat equity. Brady/Donahue clients become part of our close-knit team. As a team we trust each other and put in our sweat equity for a winning outcome. The same principles that drive a sports team drive our team as well, so we loved this creative concept to advertise our firm. CAN I HANDLE THE CASE ON MY OWN? DO I REALLY NEED A PERSONAL INJURY ATTORNEY? When accidents occur, it is common for an insurance company to ask you to make a recorded statement with an insurance adjuster. It is never wise to do so without having firstconsulted your Vermont / New Hampshire personal injury attorney. If you decide to do so without an attorney’s advice, you should keep a few facts in mind. First, insurance adjusters can sometimes discretely influence you into saying something that would insulate their company from liability, or to limit your claims. Two, any recorded statements you make to an insurance adjuster might be used against you in related litigation as the law often times requires that statements made to an insurance company be shared with the opposition during pre-trial discovery, either before or after a deposition. Your attorneys will no doubt argue that these statements are “work product” and privileged, however, this argument oftentimes will not be successful in preventing opposing counsel from obtaining the statements. As a result, not consulting an attorney expert in Vermont and New Hampshire personal injury laws before talking to an insurance adjuster could end up being very costly to you.